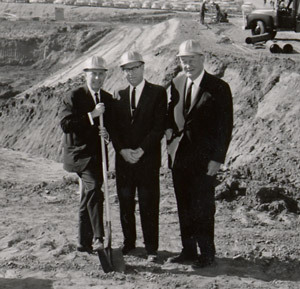 The photo shows UCLA Chancellor Franklin Murphy, basketball coach John Wooden, and donor Edwin Pauley at the groundbreaking ceremony for Pauley Pavillion, probably around 1964. (The official opening was in 1965.) Pauley – whose wealth came from oil – was a prominent Democrat. However, the fundraising drive for the structure (which Pauley matched) was headed by H.R. Haldeman of Watergate fame. Pauley, a Regent, played a major role in the dismissal of UC President Clark Kerr due to student protests, primarily at UC-Berkeley.